World War II is over and a family, mourning a son missing in action, plants a memorial tree and tries to go on with their lives. A storm blows down the tree and a devastating family secret is uprooted, setting the characters on a terrifying journey towards truth. Based upon a true story, All My Son is a classic drama by one of America's greatest playwrights. At the heart of All My Sons lies a scathing criticism of the American Dream. After its publication Arthur Miller was called to appear before the House Un-American Activities Committee, where he famously refused to give evidence against others. AudioFile Magazine review: "One of the strengths of L.A. Theatre Works is their skill at selecting quality plays previously unavailable on audio. Arthur Miller's 1947 breakthrough play is at once a postwar family drama, an indictment of false societal values and a searing tragedy. James Farentino plays businessman Joe Keller with a gruff bluster that sometimes masks a sacrificial love for his son Chris (Arye Gross), an idealist home from the war. Julie Harris, as the mother, Kate, is alternately needy, demanding, lovingly solicitous and willfully blind to the past. The live responses of the audience underscore the touches of humor that season the early acts of this landmark American drama." 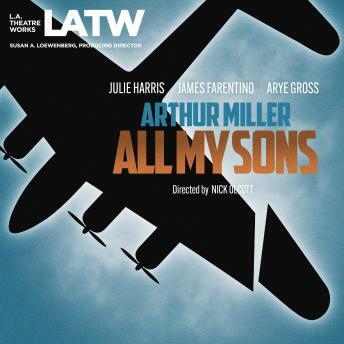 An L.A. Theatre Works full-cast performance featuring James Farentino, Arye Gross, Julie Harris, Mitchell Hebert, Naomi Jacobson, Barbara Klein, Paul Morella, Michaeleen O'Neil, Nathan Taylor and Jerry Whiddon.